of your niche in their lives. like a pull toy held by the future. to hold their disappearing figures. can blame them, we, who did the same? Poem by CB Follett from "Of Gravity and Tides." 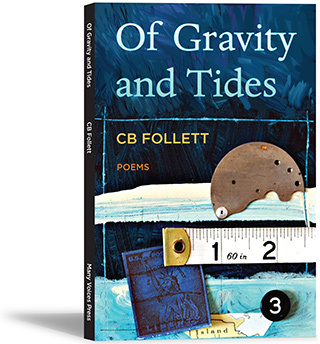 In reading C B Follett’s most recent collection, Of Gravity and Tides, I've realized that, poem by poem, it holds many of her most precisely poised and deeply powerful poems yet. These often wrenching family poems constellate and adhere in a remarkable way, informing one another, talking back to one another -- multiplying the poignancy and sadness and luminous victories as well. These are incredible poems of parents and children, the whole web of family and loss. The cosmic beauty of the title section is stunning, yet the book builds carefully to its final section, “Into the Light,” where each poem is just exquisite, perfectly and simply balanced, as we move to the book’s elegant and moving conclusion.